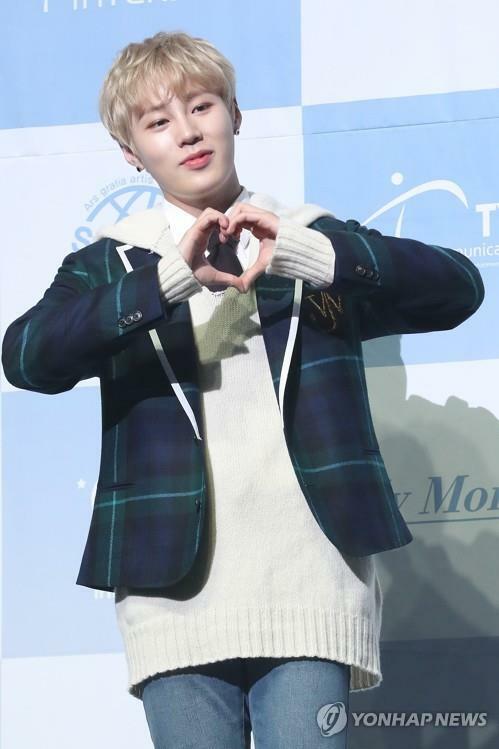 Ha Sung-woon, a member of popular K-pop boy band Wanna One, which disbanded earlier this year, officially launched his solo career Wednesday with his EP “My Moment,” a collection of five tracks, all composed by him. His first solo record will hit the shelves and online music stores Thursday, propelling him into the increasingly competitive spring music scene. “My Moment” is fronted by “Bird,” a refreshing, light number that strikes a keen contrast to Wanna One’s masculine, dance-heavy music. “With this album, I want to demonstrate the music I want to pursue, rather than seeking high (chart) performance,” Ha said in a press showcase for the EP at YES24 Live Hall in eastern Seoul. “I will be promoting this album with curiosity about whether the public will indeed like the music I like,” he said. According to Ha, the lead song comes from his experience of his time in Wanna One, which gave him “wings,” and carries his wish to fly high with the wings he got from his former group. Alongs with “Bird,” the album has four more tracks, including “Don’t Forget,” featuring Wanna One bandmate Park Ji-hoon, which was previously released in January. It also includes “Mundeuk” as the fourth track, “Suddenly” in English, a song he previously submitted to school as a college graduation project. Ha picked the track as the one he is most attached to out of the five tracks, after he trimmed and rearranged it to bring it to the commercial music scene. “I am very nervous and thrilled to present to the public music that is slightly different in style (from Wanna One). Thoughts of whether they will like it or how they will take it increase my nervousness,” Ha said. “But I am also very pleased to come up with my first solo album, which I have worked hard to produce,” he added. Nearly one month has passed since Wanna One’s last performance in January, but the band still accounts for the lion’s share of his personal and music life. “I had a lot of things I wanted to achieve as I dreamed of becoming a singer since I was little, and I think I achieved many of them while in Wanna One. It was a moment of dream itself, for which I am truly grateful,” he said. Ha is “curious and expectant” rather than wary of other Wanna One members going solo and becoming potential rivals in the competitive K-pop arena. “As I have my own color, the other bandmates all have colors of their own, so I am chiefly curious about what music they will come up with,” he said. For the moment, he will satisfy his fans and focus on his solo career, rather than going back to Hotshot, he added.